Miaoulis Square, one of the few squares in Greece of the 19th century, is now the heart of the city, the place of the evening walk, the obvious meeting point for residents and visitors. The original name, "Othonos Square" was to honor the first king of Greece. After the expulsion of King Otto in 1862, the square was renamed "Leotsakou Square" in honor of Nicholas Leotsakos head of the garrison of Syros. The present name was given in 1889 when it was unveiled the statue of Andreas Miaoulis. There stands the building of the City Hall, one of the largest town halls of the country, the work of the German architect Ernst Ziller, founded in 1876 and inaugurated in 1898. The building - an emblem of Syros with its special and impressive 19th century architecture, with marble columns and beautiful ceiling paintings, impresses all visitors. 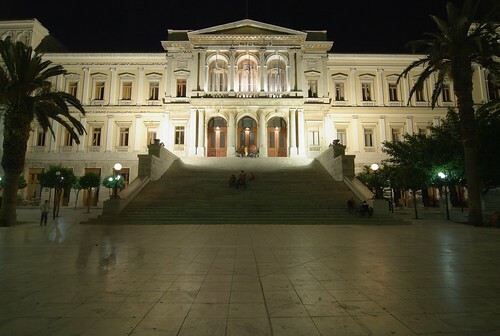 Apart from the municipal services, the town hall houses the courts, the Land Registry, the Archaeological Museum of Syros (with Cycladic and Byzantine exhibits and the Historical Archives of Cyclades hosted in Megaro Ladopoulou) and other public services.